Saturday afternoon after a busy morning, I settled in on the glider on my back porch and read a little as Mouse played at her water and sand table. Not much reading actually got done, as you can imagine. Three year olds like attention. Plus, there was a not to be missed tea party. Still, it was a nice way to spend the afternoon. Sunday we went to a local museum to check out the dinosaur eggs. It was not much of a museum, truth be told, and was rather disappointing. They had a Biblical Garden that we strolled through that has clearly seen better days. Mouse seemed to enjoy herself, just the same. The weather was perfect for being out and about. It is hard to believe today is the last day of September. The month always flies by for me. Mouse is already talking nonstop about Halloween. We put up some of the decorations around the house this past weekend. Mouse wants to be a princess this year, and I have a feeling there will be no last minute changes like there were last year. Luckily, we still have last years dress which still fits her. One less expense to worry about. Somehow we have ended up with at least three or four crown choices. I am not sure where they all came from . . . I finished reading A Penny for a Hangman by Tom Savage this weekend. I enjoyed the thriller, and look forward to sharing my thoughts with you in a couple weeks. Yesterday I began reading Fingersmith by Sarah Waters for the read-a-long hosted by Literate Housewife this coming month. Set in Victorian England, Fingersmith is the story of orphan Sue Trinder, who becomes a maid for a wealthy heiress in a plot to steal her fortune. I fell right into the novel and am enjoying it so far. I am excited to finally be reading something by the well-liked Sarah Waters. At various points in the past, I have had plans to read The Little Stranger and Night Watch, but it just never worked out. Not yet, anyway. My name, in those days, was Susan Trinder. People called me Sue. I know the year I was born in, but for many years, I did not know the date, and took my birthday at Christmas. I believe I am an orphan. My mother I know is dead. But I never saw her, she was nothing to me. I was Mrs Sucksby's child, if I was anyone's; and for father I had Mr Ibbs, who kept the locksmith's shop, at Lant Street, in the Borough, near to the Thames. I can't believe October's here. Just two more months and it's the beginning of a new year. Time really flies! Can't wait to hear your thoughts on Fingersmith. That's definitely on my to-read list after hearing so many blogger friends raved about it. Melody - These final months of the year always seem to go by so fast for me. I want September back! Maybe not the heat though. I loved The Fingersmith and like the intro as well. Hope you enjoy this one. (I can't believe tomorrow is October! Diane - So far I am really liking Fingersmith. Favorite book of the year contender? It's too early still to tell, but maybe . . . If you decide to read The Little Stranger, try to find it on audio. It is narrated by Simon Vance and is incredible. I love Fingersmith though. I think it is her best. You would like Affinity though too. Night Watch is a totally different novel...not gothic or twisty like some of her others. My daughter was ALWAYS a princess for Halloween when she was little. And she would get these elaborate princess dress-up costumes for Xmas, so we were usually good when Halloween came around. You gotta love that. Sandy - I've enjoyed another books I listened to that he narrated. I will have to see if Audible has Little Stranger. I don't know though. With my audio book track record . . . I'll be lucky to finish listening to one this year. Mouse has now decided she wants to be Queen Isabella (a character from one of her favorite cartoon shows) and so I'm trying to convince her that queens don't always wear the same dress--and her princess dress can substitute as a queen's dress. Mouse likes playing dress up at school, but not to so much at home I've noticed. Yay for saving some money on Halloween costumes! The expense for those always sets my teeth a bit on edge. It got pricey when we had 3 who where trick or treating. It almost made me learn how to sew! Your Sunday sounds lovely and reading with the Mouse sounds about like reading with the Tornado! The intro sounds interesting and I've seen raves for Sarah Waters' books so I'd definitely keep reading. Hope you enjoy! Katherine - Anything to save money! I do wish I sewed though. Life would be so much easier. Mouse and Tornado could read to each other. Haha! Vance loved to dress up but, oddly enough, was never all that into Halloween. I need to try a Sarah Waters' book! Kathy - Isn't that funny? I think it's just fun for them to dress up. Mouse likes the trick or treating part (which is funny because for awhile I wasn't sure I would even let her do it), although not for the candy's sake. It's the act of going door to door and having people comment on how cute she is she likes, I think. 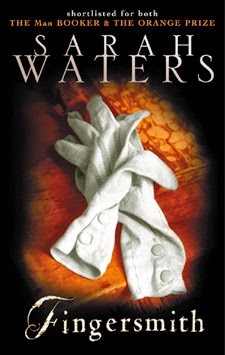 I have never read Sarah Waters, but I recently downloaded The Paying Guests...hope to read it soon! I love the sound of Fingersmith. Halloween has seen many interesting costumes in my house, and my daughter was a French maid one year...found photos when I was searching through albums recently. Laurel-Rain - I hope you enjoy The Paying Guests! I only recently learned about it. I will probably read some of Waters' back list before trying that one. One of my daughter's best friends is going to be a crow for Halloween, and I just love that idea. It's different. Of course, it's lucky her mom is handy with a needle and thread. I'd be at a total loss and hope I could find a crow costume at the store. A book that I put off reading due to all the hype. I'll have to see if I can get a copy at the library now that (fingers crossed) the reservation list will have gone down. Tracy - I don't really remember hearing about Fingersmith when it first came out. Sarah Waters has been on my must read author list for years though. I always thought Night Watch would be the first book I read by her. Nope. I still want to read it though. I read this a while ago. Intriguing read. Mystica - I am enjoying it so far. Sounds interesting! I would definitely keep reading! Kim - It is interesting. I love everything about it so far. Well, except a couple of the characters I hope will meet a bad end. I've added Fingersmith to my TBR list. The opening makes me want to keep reading. Sounds like a good story. I'm sewing a Halloween costume for my granddaughter (she's 3). At first, she said she wanted to be a blueberry! But now she's decided she'll be a doctor. So I'm making a lab coat (out of an old dress shirt of my husband's) and scrubs. I'm having so much fun creating! Here's the link to my Tuesday post: SUMMERTIME. Sandra - Fingersmith is soooo good! I envy you being able to sew. I wish I learned. I am sure your granddaughter's costume will be wonderful. Suzie - I've always heard such great things about Sarah Waters as an author. I am glad to finally be reading something she's written. This was my first Sarah Waters book and I loved it... quite a page-turner. Enjoy! JoAnn - It is! I am loving it so far. I'd like to know more about the book before deciding, but I like the intro! Sarah - I'm so glad I didn't know much about this book when I went into it. I love being surprised. I have yet to read a Sarah Waters book. Maybe this is it. At least I like the way it starts. I would keep reading Fingersmith, as it sounds like my kind of book. I have a copy of her latest novel, The Paying Guests--if only I could find enough time to get it started. Thanks for visiting my blog. Have fun with your Halloween preparations. I haven't heard about this book, but it does sound good. Ah the princess at Halloween! My niece was one for years until she decided she is done with it. So guess what she became next Halloween? A zombie princess, ha! It's such a great experience, seeing the world through Mouse's eyes. She finds pleasure in the simplest things. I like the intro, and the book sounds intriguing. I haven't read anything by Sarah Waters yet, but this sounds like a book I'd like. Thanks for stopping by my blog today! Monica - Fingersmith is really good so far. I keep looking at my book thinking I should be reading. It's one of those books I cannot stop thinking about even when I am not reading. 'Fingersmith' is a book that's been on my TBR list for a couple of years now. One of these days... I just started (like, 15 pages in is all) Whitney Otto's 'A Collection of Beauties at the Height of their Popularity'. No opinion of it so far- not sucked into it instantly like some books can manage, but the concept is interesting. Laurie - I enjoy books set in San Francisco. It's one of my favorite cities. I will have to look for Otto's book. I hope you are enjoying it. Susan - I am really enjoying Fingersmith so far. I think you will too. I haven't read anything by Ruth Bidgood. I'll have to give her a try! Kelley - I hope you had a good week. I am really enjoying Fingersmith so far. I haven't read Sarah Waters yet, but I am intrigued enough to want to check her out further. Glad you had a fun weekend with your daughter, and at least the weather is cooling down a bit now to be able to spend more time outside--enjoy. Rita - I'll be happy when the weather stops its yo-yo game. This past Saturday was another hot one, especially for the kids and parents on the soccer field. My kids are also talking nonstop about Halloween. I love it too (even though I'm such a chicken about scary things). I just love how imaginative it is. My kids are going as crayons from The Day The Crayons Quit (they dress up as storybook characters for the parade at school). As for reading... well, I haven't been doing much of that lately. I have a few new books I'm hoping to get to this weekend, but I'm not sure how successful I'll be. I'm reading lots of kids' books, though. A.M.B. - I like Halloween too. Mouse keeps asking me though what I am going to be for Halloween. I never dress up--at least not in a very long time. She didn't accept my mommy answer and said I can't go as myself. I love the idea of your kids going as crayons. How creative! Perfect time of year for Fingersmith! I hope you really enjoy it. I've also read Affinity and liked it but not quite as much. Thankfully she has several others to get into! Too funny about the crowns and Mouse's outfit. Maybe she can wear a different one on different occasions. And if it's like our house--that stuff just kind of appears. I'm not sure where all our dress-up attire comes from either! Trish - I figure now is as good a time as any. :-) I am really enjoying the book so far. At least we will have extras if she loses a crown too, right? "3 year olds like attention"